A few Sundays ago, I arrived late at the farmer’s market and, heading straight for the vegetable stand, grabbed the afternoon’s stragglers: two bags of baby spinach, a handful of little potatoes, and a bag of slender, bright carrots. We ate the spinach that night, eagerly, the tender leaves drizzled with a thick tahini sauce. A few nights later, as I prepared steaks, the potatoes made their way into a pot of water and then onto a roasting pan, where I smashed them one after another, before tucking them into the oven, almost without thinking, in what has become our trusty default. The bag of carrots was nudged into the back of the crisper drawer with the new arrivals I brought in the following week. They began to shrivel, and when eating them raw was no longer an option, my mind turned to carrot cake. Now, I have wanted to make Rose Bakery’s Carrot Cake for quite a while. So when my mind turned to carrot cake, it quickly became clear that it would be Rose Bakery’s Carrot Cake. I have had the bakery’s cookbook for close to a year now, its bright green cover sticking out conspicuously among its more neutral companions. This could be an advantage, if, say, this was the cookbook I turned to in a rush, its cover saving me a few seconds by leaping out at me. Rather, the fact is that my cookbooks nest in a shelf below our television, and when I get comfortable on the couch, and begin unwinding, this particular cookbook gives me something to fixate on, getting me all riled up. Let’s start with the title, since that’s the first problem I encountered when writing down my thoughts. The cover of the book has the following words: Breakfast, Lunch, Tea, Rose Bakery. On its side, we have the author on one end, “Breakfast • Lunch • Tea” in the middle, and at the other end: Rose Bakery. When writing out the title should it be “Breakfast, Lunch, Tea” or “Breakfast – Lunch – Tea”? And where does “Rose Bakery” fit in with this? The back of the book announces: “The many little meals of Rose Bakery” and, surprisingly, this is how Amazon bills the book: Breakfast, Lunch, Tea: The Many Little Meals of Rose Bakery . I open the book searching for clues. On the inside of the cover, it says “<<Breakfast, Lunch, Tea>> is the first cookbook by Rose Carrarini”. I’m annoyed by the use of guillemets, or angle quotes, instead of regular quotation marks, a peculiarity that continues throughout the book. I would also like to send them a note regarding the practice of italicizing titles or at the very least underlining them. We are not even one word into the narrative. Flipping through the cookbook’s luxuriously thick pages, I’m happy to see ingredients listed by weight (grams) and by cups, but find “translations” of ingredients, such as “floury (mealy) potatoes,” “beetroot (beet)” and “soured (sour) cream” (all on page 75), slightly annoying. Translations of just a handful of ingredients into French, such a kohlrabi into “chou rave” (33), is rather random, and as much as I rack my brain as to their possible purpose, I’m at a loss. I also really can’t imagine why kohlrabi was included in the nine ingredients showcased under “choosing ingredients,” when a quick glance at the index shows kohlrabi makes its appearance in just one recipe. From the six page introduction, to the headnotes and the recipes, the prose is repetitive, stiff and far from elegant. Turns of phrase such as “We also have on the menu a smoothie, to which we do not add crushed ice as they usually do in restaurants,” (46) could have easily been turned into the smoother “We also have a smoothie on the menu…” Phrasing such as “the soup must have a slightly sweet/sour taste” (75) could have taken a less stern route with “the soup should have”. The book is filled with such things, and they make my skin crawl. Now, I pick up on errors on the page like they are waving me down with a glow stick (you know this doesn’t apply to one’s own writing, right? ), but usually they are few and far between. This book, however, kept me on edge THE. ENTIRE. TIME. Trying not to judge a book by its cover (or its prose), I ventured into the kitchen and made the Classic Pancakes, substituting spelt for the white flour. The pancakes were fluffy and light- definitely a recipe I would reach for again. Feeling a little less petulant, I decided to try a scone recipe next, of which there are no less than six. I settled on the Maple Syrup Scones, which Rose declares is her favorite. It was a sunny weekend morning, and I set the table in the garden with linens and flowers. The scones were grainy and flavorless, and pretty disappointing. This weekend, armed with my bag of shriveling carrots, I tackled the Carrot Cake. The ingredients are pretty straightforward, but I managed to get annoyed at the “4-5 medium carrots, finely grated”. If the carrots are medium, I would think that eliminates the need for a range. Either explain the reason for a range (“for a more pronounced carrot flavor”), or be decisive. Next, Rose instructs to butter a 9 inch cake tin, while the picture on the opposite page features little round individual cakes each topped with a thick cap of frosting. The recipe says it serves 8; I count 20 little cakes. I opt for my muffin tin. The batter comes together quickly. It’s gorgeous- thick and fluffy and dotted with bright orange flecks. In fact, it’s so pretty that I grab my camera and try to take a picture for you, but the lighting in my kitchen does not cooperate. The cupcakes bake up beautifully, and are moist and delicious. The icing is as simple as beating butter with cream cheese until smooth, then adding vanilla and confectioner’s sugar, and it tastes like a cheesecake cloud. 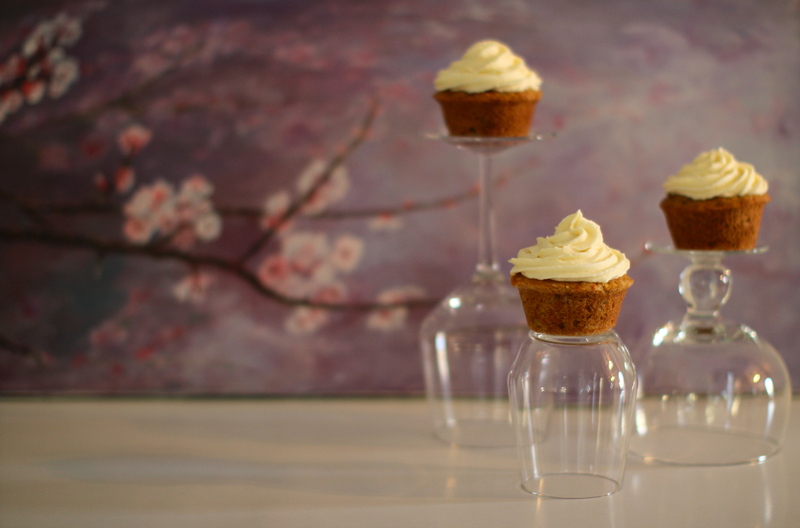 I ice the cupcakes, and bite into one, my teeth sinking into the decadent icing, before hitting the earthy, spiced carrot cake, speckled with cinnamon. I wish I had a parade of girlfriends to invite. There are 17 left. So, to recap: I feel a little less angsty when sitting on the couch opposite my cookbook shelf. Also, make these for your next party. This recipe is everything you would expect from a classic carrot cake- moist and earthy, speckled with cinnamon and studded with walnuts. 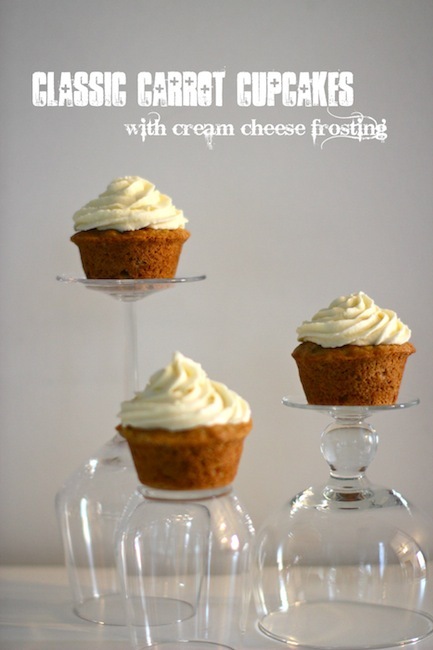 The cream cheese icing is decadent and rich. For a generous mound of icing (as pictured) you might want to double the quantity, for a more subdued slather, this amount should be fine. Preheat the oven to 180C/350F, and generously butter the muffin tins. In a small bowl, mix together the flour, cinnamon, baking powder, baking soda, and salt. Beat the eggs and sugar until they are light and fluffy, but not too white and meringue-like. Pour in the oil, and beat for a few more minutes. Fold in the carrots, and then the flour mixture, followed by the walnuts. Pour the batter into the prepared tins, and bake for 15-18 minutes, or until a toothpick inserted into the center comes out clean. 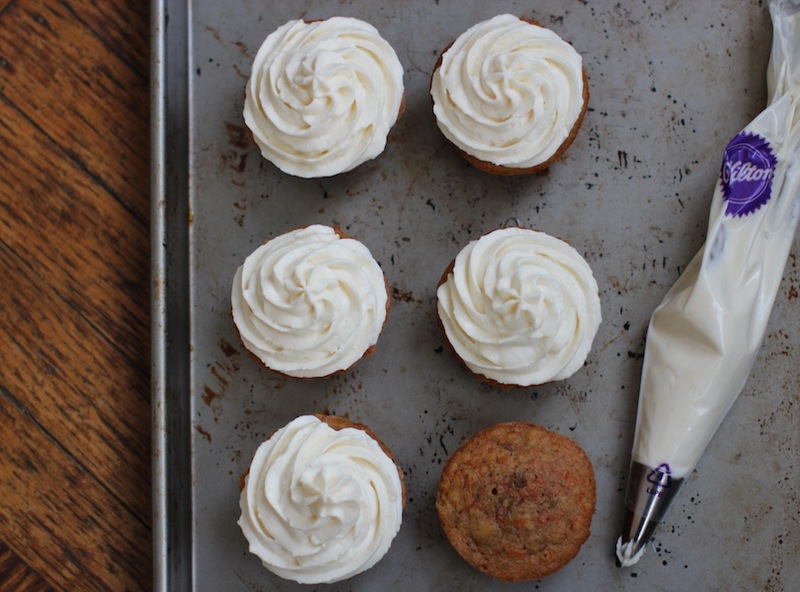 Allow the cupcakes to cool for a minute in the tins before turning them onto a cooling rack. To make the icing: Beat the butter with the cream cheese for a few minutes until smooth. Add the vanilla extract and the confectioner’s sugar, and beat until incorporated. 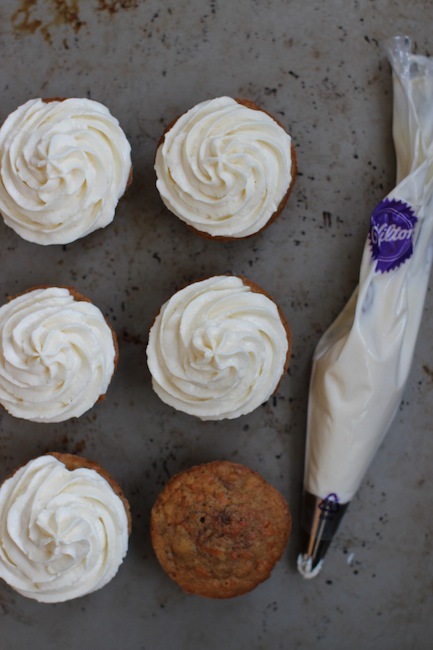 Pipe or slather the icing onto the cooled cupcakes. The unfrosted cupcakes will keep for two days, well wrapped (I herd them into large Ziploc bags). Frost them as close as possible to serving. I stored leftover frosted cupcakes overnight in the refrigerator, and the texture of both the cupcake and the frosting hardened, and deteriorated slightly. Not that it kept us from eating them. Please save the trapped carrot cup cake under the glass for me!!!! The pictures are soooo nice…and soooo elegant! Ooh La La! You are so artistic the way you display the cupcakes on top and under the over-turned glasses and with the blooming cherry tree gently in the background. I want to try the recipe just because of your presentation and I think it is one of my son’s favorite. I would not have even begun to think of such a wonderful outcome from carrots starting to shrivel. You’ve inspired me as well. Hi there, I am a first time visitor here and am enjoying reading your blog. 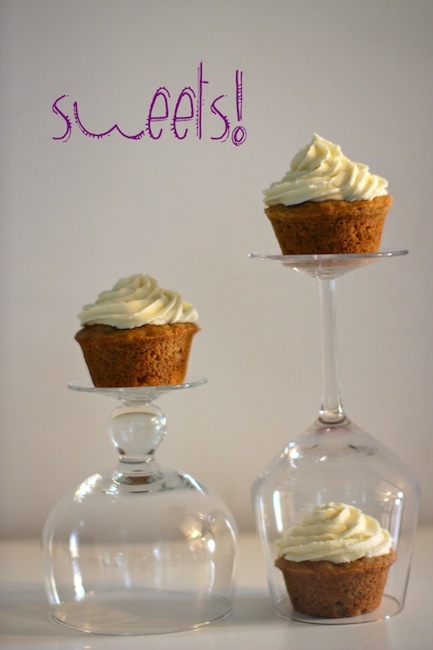 These little carrot cup cakes look so adorable on their little glass stands and not to mention they look delicious to boot! 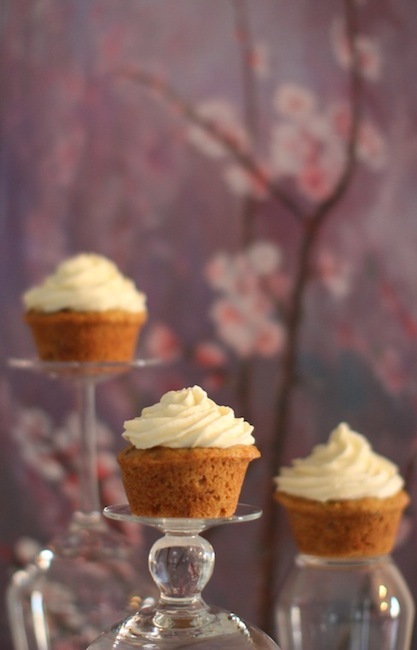 These little carrot cake cupcakes look terrific. I’ll be bookmarking this one to try out myself soon. Thanks for posting your photos and the recipe! Thanks for taking the time to comment. I hope you’ll like them as much as we did! you did a great job with with the decorating bag!